Printemps Tunisien, directed by Raja Amari, takes place in January 2011 in Tunisia, just weeks prior to the fall of President Zine El Abidine Ben Ali. The storyline follows three young men and a young woman as they struffle to live in their oppressive world. Fathi is a young teacher committed to his girlfriend, Noura, who is a middle class revolutionary that organizes protests using social media. Walid is rational but represents those desperate for power as means to escape. Moha is defeated and anxiously hopes to embark on Lampedusa and go to Europe. These four youth that meet during the Tunisian revolution all struggle to survive the historical revolution, and the three male musicians remain motivated to survive through their contempt of one another. The storyline of this film qualifies the detriment brought by dictatorship to the people of Tunisia and illustrates the struggle of these youth to come of age during the volatile times of revolution. Barlet, Olivier. "Printemps Tunisian by Raja Amari." Africultures. 10 Dec. 2014. Ellerson, Beti. "Raja Amari: Printemps Tunisien." African Women in Cinema8 Feb. 2015. Armati, Lucas. 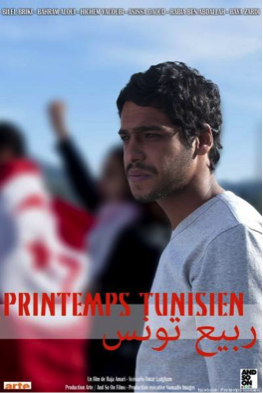 "Printemps Tunisien, A Rich Humanist TV Movie." Telefilm. 18 Dec. 2014. Armes, Roy. “Cinemas of the Maghreb”. Black Camera 1.1 (2009): 5–29. Web.